This is coming up in a future auction its nothing I have any interest in purchasing but the coin looks a little odd. The dimple in the middle is what I am questioning.Though the description does given an answer to why a dimple is present and I have found some coins from Perinthus with the dimple.This is a learning exercise for me as it might be for others,especially what recently happened with another auction house plus this one that has this current coin has sold fakes in the past.One of which I happened to buy which turned out to be fake as did another and money was promptly refunded upon return. It came up for sale in auction in Europe I think in June no takers on it and now pops up again in another auction. The jpegs are as from the June auction and the current one. 58-63 AD, Perinthus (Balkan) mint . . RIC 107 variant (bust type); MacDowall WCN 74 variant (bust type), both Rome, but the dimple on both sides are suggested to denote the Balkan mint; Sear 1956 variant (obverse legend, bust type). 30.89 grams. That one looks genuine but smoothed til tooled. Obv. : NERO CLΛYDIVS CΛESΛR AVG GEKM IM TPΛ IMP [P P?] , his laureate head facing right, clear dimple on cheek, in parts Greek letter style (Y for V, Λ for A), spelling errors. Rev. : DECVRSIΘ / S - C , Nero, bare-headed and in military attire, prancing r. on horseback, holding spear with r. hand; behind him, mounted soldier prancing r. with vexillum held over r. shoulder; DECVRSIΘ in ex., S - C flanking in fields; weak dimple on horse just above emperor´s knee; spelling error Θ for O.
unlisted, cf. RIC I, p. 186-7 ; cf. RPC I, p. 320, nos. 1758-62 ; RPC consolidated supplement 1-3, - ; online available databases - . 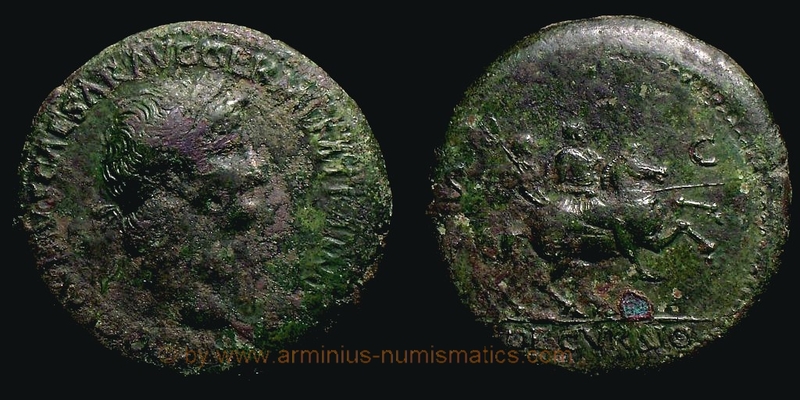 Here's another Thracian sestertius with dimples and the same DECVRSIO rev. type, recently sold in Pecunem 39, 4 Jan. 2016, lot 863, 23.18g. Plus a second one that I found among my pictures. The coin shown by Adrian is curious because it lacks S C. So is it a Thracian coin with S C removed by the tooler, or an early Rome-mint coin really lacking S C, but with dimples added? i already saw your posts searching Forum for similar issues. The dimple on both sides, Greek letter style (Y for V, Λ for A, Θ for O), spelling errors plus the irregular alignment suggested a Balkan mint. All the Latin coins of Perinthus are rare. BMC does not list Perinthus mint, but identifies another type as "barbrous". RIC notes the existence of Balkan sestertii, dupondii and asses but does not catalog them. "Basemetal's sestertius, with centration dimples, was struck at a branch mint in Thrace. Coins of this mint were little known before coins began flooding out of Bulgaria and Romania with the fall of the Iron Curtain. I wonder if any from this mint were included in Kleiner's die corpus of Arch sestertii of Nero." "Since the series was only recognized by MacDowall in Num. Chron. 1960, but most of the known specimens have only emerged from the Balkans after 1990, the series is abysmally catalogued in the standard references. My own assemblage of material appearing after 1990 has been haphazard, so not thorough or systematic." You see, i´m very much and gratefully depending on your knowledge.